"muscular bass shapes and sparking percussions..."
New York-based DJ, producer and electronics artist Antenes operates a laboratory of self-made sequencers and synthesizers using vintage telephone equipment built in the name of sonic and spatial exploration. Known for her inventive soundscapes and eclectic DJ sets, Antenes treats the studio as a space for sculpting emergent patterns, textures, and percussion layers. 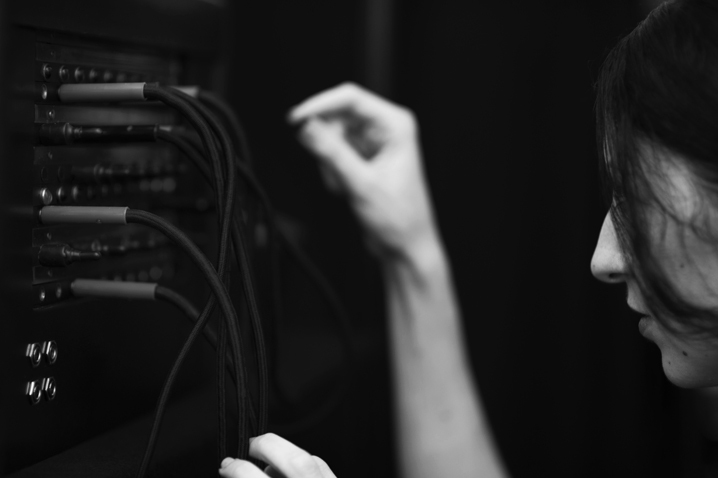 Drawing musical influence from the curious and ephemeral sound-world of outdated telephone systems, her productions and live sets often integrate sounds reminiscent of pulsing analog relay switching systems, errant radio transmissions, cross-continental echo, signature drones and message interferences between the wires. A Brooklyn resident by way of Chicago, her vinyl DJ sets dive into acid-laced techno, shimmering electro, shadowy atmospheres and beyond, with a particular ear for odd percussions and syncopations. Her sensibilities as a DJ have awarded three of her podcasts (LIES 025, Juno Plus 119, and Phormix 44) to be featured in Fact Magazine’s Week’s Best Mixes column. Her 2015 solo production debut, The Track of a Storm EP on L.I.E.S. reveals three tracks of otherworldly techno infused with “lazer shot synthwork,” “ghostly noise layers,” “muscular bass shapes and sparking percussions,"(per Boomkat) appearing on the 2015 best-of lists for Juno and Fact magazine. She recently collaborated with Moog Music in modifying their analog circuits into new instruments for a large scale installation and durational performance, “The Exchange” at MoogFest 2016. Her first collaborative/duo performance took place alongside Electric Indigo at the Roulette Theatre in Brooklyn, in support of synth pioneer Suzanne Ciani. A devoted practitioner of boundary-crossing between genres, Antenes has held residencies for electronic arts at Harvestworks (NYC) and Signal Culture (Owego NY) and has appeared at numerous interdisciplinary events including the New York Electronic Arts Festival, Fermi National Accelerator Laboratory’s “Intersections” exhibition (Batavia, IL), Open House London’s Sonic Visitations, and Trinity College’s Science Gallery (Dublin). Inspired by the Buchla 100 modular system, her synth work is featured in the 2013 film I Dream of Wires: The Modular Synthesizer Documentary, as well as in several master’s theses including Mills College, Fashion Institute of Technology and Clemson University. She also leads hands-on DIY synth workshops, having recently lectured at CalArts, Oberlin, and UC-Boulder’s music departments, along with Monthly Music Hackathon, Dame Electric at Pioneerworks and Women’s Synth Workshop at the Kitchen (NYC). Antenes is currently an Artist in Resident at Issue Project Room, co-sponsored by Bell Labs. See also www.meridian7.net.